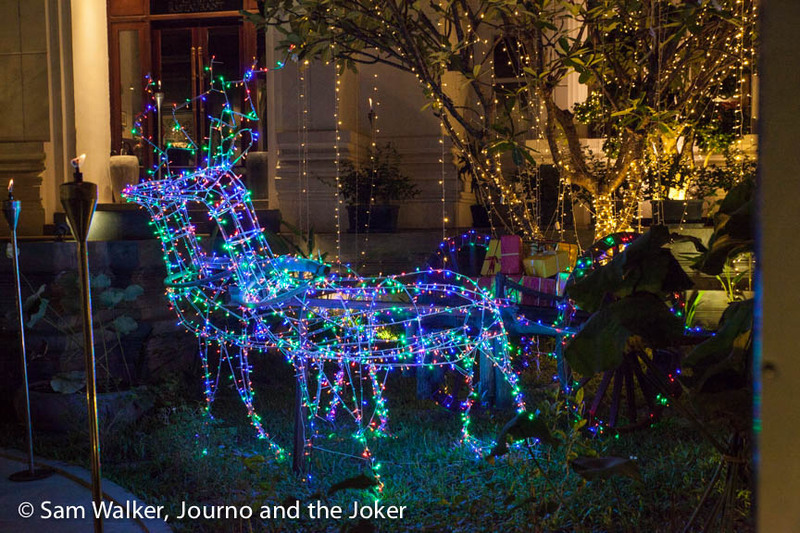 Happy Merry Christmas from the Journo in Siem Reap and the Joker in Darwin. My second Siem Reap Christmas has dawned and it is going to be a little strange today without the Joker or any family to share it with. Fortunately, amazing friends surround me and a full day of food, drink, friendship and laughter awaits – including Malteser, Mars Bar cheesecake. 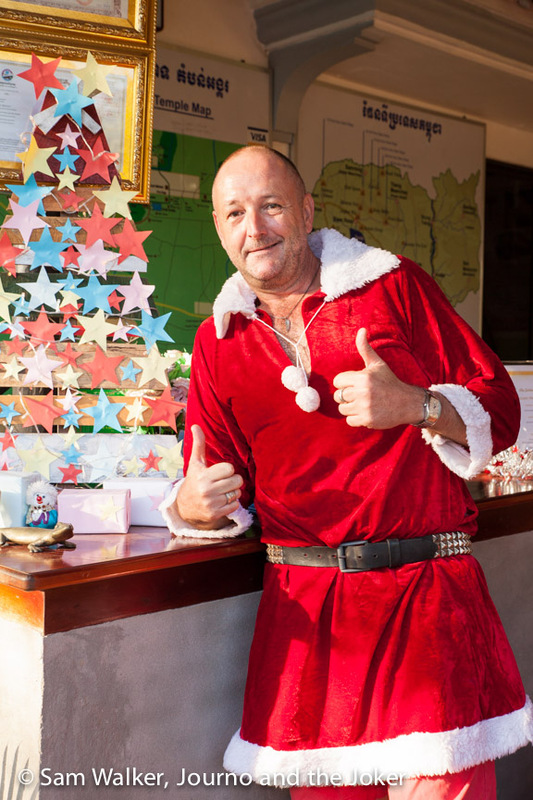 It all started with a champers and OJ – thanks to the guys at the Golden Gecko Villa, where Paul is dressed in a Santa suit — so it was off to a good start! 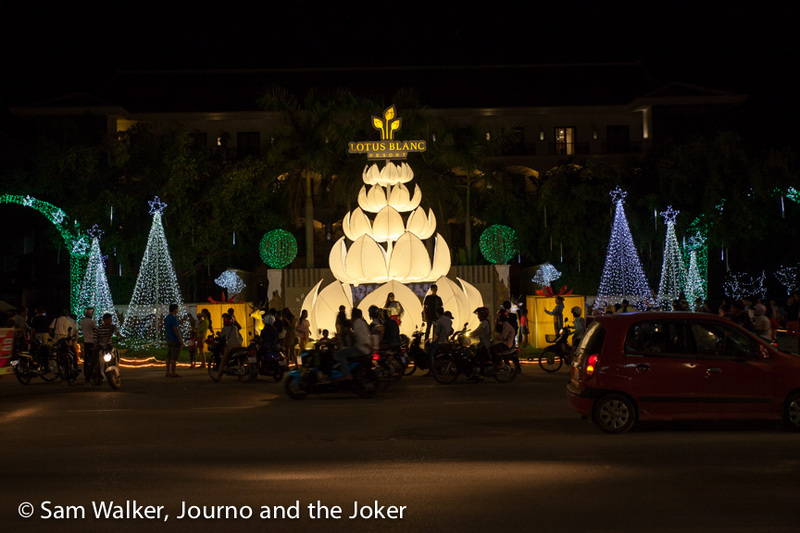 Christmas in Siem Reap seems to be bigger than last year. Christmas trees have cropped up everywhere, decorations are elaborate — incredibly so at some places — and interesting, and the Christmas lights are twinkling. I went to look at some of the Christmas lights last night and they have become a major attraction for the local people who are pulling up in droves and taking selfies with all the lights. Security guards are monitoring the traffic. They say it’s the season of giving, but I am blessed to be around people who give all the time, all through the year. On one night this week, two separate tuk tuk drivers refused to take money from me. It is these selfless acts — indications of warmth and friendship from people who earn small money — that I treasure. And it is a reminder that the season of giving should be 365 days and should not just come about once a year. It’s also a reminder that it is the small things that often count the most, the personal and not the commercial. So on that note, I’m going to sign off with warm wishes to all our readers and supporters, to our family and friends. With hopes that you all cherish the time you have to spend with your loved ones and your friends.